Based in Essex, we collect throughout the UK and the rest of Europe. We provide IT Equipment Recycling services to small and large businesses, with our computer recycling processes being 100% eco-friendly. We adhere to the WEEE directive and other best practices around IT Equipment recycling and disposal. Recycling Your IT offer a top service including certified and accredited IT Equipment recycling and data destruction. We aim to make IT equipment disposal easy and hassle free by offering you complete traceability of assets, security of data and documented proof for legal compliance. Whenever you have an IT Equipment disposal requirement, please do contact us to discuss your requirements. We will send one of our tracked vehicles from our huge fleet to collect your office IT Equipment. It will then be transported to our national distribution centre where it’ll be examined by our team of experts. Our IT equipment recycling / disposal experts will carefully determine the best course of action; whether it has to be re-used or recycled. We separate any IT Equipment that is in working condition, refurbish it and distribute it for re-use across UK and even to some of the developing nations. 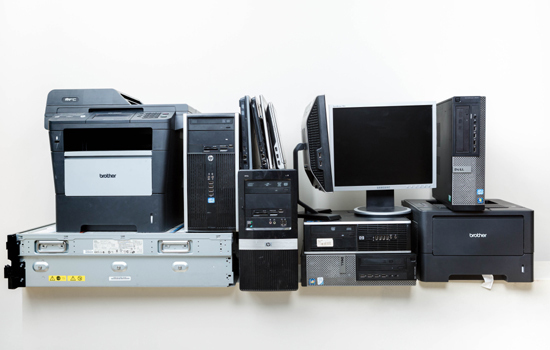 Any IT Equipment that cannot be re-used will be broken down into its component raw materials. We then send these raw materials to be recycled to the specialists in the field. When it comes to any sort of IT Equipment Recycling – be that computer recycling, monitor recycling, server recycling or network recycling, we are the go to experts and we will provide you with the appropriate Environment Agency paper work and if you have opted for “proof of destruction” to have your sensitive data wiped from the hard drives, we will provide you with certificates that verify it has been done. We do not bury or burn any of the equipment and hardware we receive – our IT Equipment Disposal / Recycling processes are absolutely safe and eco-friendly. No landfills, no toxic fumes. So go ahead and make a difference! Let Recycling Your IT take on your IT Equipment disposal requirement right away!